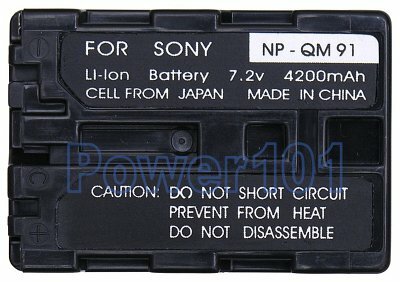 NP-QM91 is the largest size battery in the Info-"M" series NP-FM50 NP-QM71 and NP-QM91. FM50 is rated about 2-hours, QM71 around 4 hours, and QM91 around 6-8 hours. FM50 is also the lightest when QM91 is the heaviest. QM71 is highly recommended for camcorder use. First of all, it does not extend out of camcorder as much as QM91. Second it still looks aestetically pleasing. Third it will allow you to tape longer than 3 hours which is what most on-stage events run for. What is the difference between FM70 vs QM71 and FM90 vs QM91? At first, FM70 and FM90 batteries were developed. When they appeared, there were no super-fast 2-hour chargers for these batteries. A regular FM charger would take 4-6 hours to charge them because of higher capacities and the same charge current as used for FM50. Eventually, a need for super-fast 2-hour charging appeared, and sony released the "QM" series that had circuitry that could handle faster charging. Other than that, both FM and QM work the same. 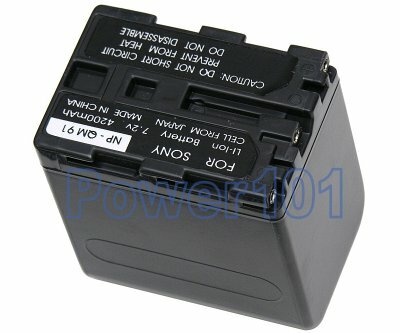 This battery is compatible with the many camcorders such as Sony DCR-DVD101, DCR-DVD201, DCR-TRV950, HDR-HC1, CCD-TRV138, DCR-DVD100, MVC-CD500, DCR-TRV260, DCR-DVD301, DCR-TRV460, DCR-TRV19, DCR-TRV280, CCD-TRV128, CCD-TRV318, DCR-TRV250, DCR-PC110, CCD-TRV308, and many others. If your camcorder is not listed - please check our camcorder battery finder to see which battery you need. These batteries can be charged by any chargers intended for FM50 QM71 QM91 or FM70 or FM90 batteries. Such as the chargers that may come with the camera/ camcorder. They can also be charged on camcorder.